Who can and should belong? 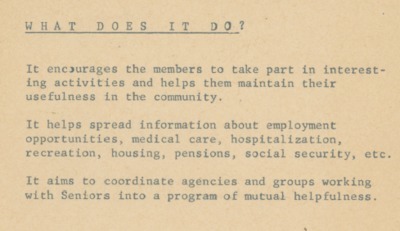 In an early 1960s welcome brochure, the Center invited centers to a place “where you may just “loaf,” tune in the radio or TV, read, play, games or just relax in company with friends, and to share talents and interests with “those less fortunate.” Over the years, seniors have become more active. Images and articles from the Center’s archives highlight increasing numbers and variety in aerobic activities – from square dancing and billiards to Armchair aerobics, “gentle yoga” and Tai Chi. Performances continue to include singing, but high-kicking dancers also have an opportunity to make an impact. In addition, social activities from discussions and festive meals on the holidays to sewing, painting, ceramics and other crafts continue to engage seniors five days a week. Fashion shows also highlight seniors’ creativity. 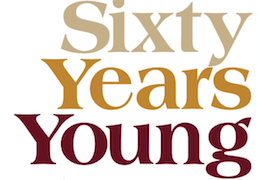 shows also highlight seniors’ creativity. Over the years, offerings for seniors have increasingly emphasized keeping physically active. 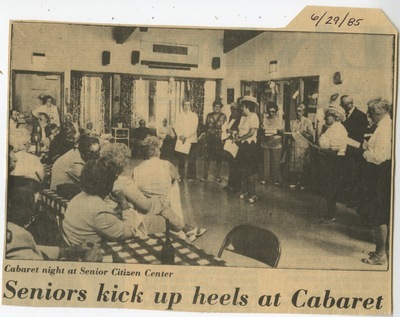 Images and articles from the Center’s archives highlight a variety of aerobic activities – from square dancing and billiards to armchair aerobics, “gentle yoga” and Tai Chi. Performances continue to include singing; high-kicking dancers also have an opportunity to make an impact.